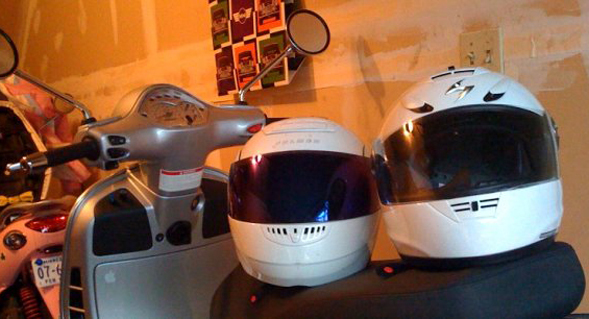 April 30, 2009 — Today was a short check ride comparing my old Fulmer Modus flip-up helmet to my new Scorpion EXO-700 solid full-face helmet. My main motivations for replacing the Modus were weight, ventilation, the added safety of a solid chin bar, and especially noise reduction. For any helmet, fit is of course the most important factor after safety rating. My big head doesn’t fit well in most helmets, and unfortunately each manufacturer somehow has a different idea of what 62 cm looks like inside a helmet. My new XXL Scorpion, thankfully, fits like a glove. It’s just a touch tight in the cheek pads, but those will break in. I rode out on a quick jaunt first with my old Fulmer on, then came back and strapped on the Scorpion for comparison. Not only does the Scorpion feel like it’s about 40% lighter, it’s about 60% quieter. Gone is the jet engine “boom” in each ear and I can actually hear the quiet growl of my Vespa again. Also gone is the wind swirl around my eyes. The angle of view is significantly wider and taller — almost disappearing entirely from my peripheral vision. The EXO-700’s four front and five rear vents keep my head downright chilly if they’re all open. Lots of air comes in under my chin as well. A little too much air actually, so I think the chin skirt is in order. The no-fog visor shield lived up to its claims, although I need to procure my signature Scooter Stig mirrored blue. My only complaint about this helmet is that the visor’s first notch open creates an gap of more than an inch. I’d much prefer a notch between there and closed, maybe 3/8″ to allow just a little bit more face airflow than closed. Small issue though. A great helmet otherwise. Finding that my Scorpion EXO-700 was indeed $200 well spent. Discovering that Motoprimo had sold me a mirrored blue visor shield for the EXO-1000 instead of the 700 and the 45 minutes I spent trying to get the damn thing to fit on my helmet. Also, the continuation of my illustrious wobble and the Vespa just feeling goofy and unsure in curves. Is it me, or is there something just not right about this bike? since I don’t know these brands is the Scorpio the helmet on the right? Yes, the new Scorpion is on the right. It’s got sort of a lightning bolt S logo on the helmet’s forehead. I would have liked to have seen a more in depth look at the two helmets but maybe you did that while I was way for a month in europe? There are a couple of reasons I didn’t go very deep on these two helmets. First, there are lots of great Scorpion EXO-700 reviews to be had online already. Second, what anyone experiences in a helmet is about 85% fit, and that varies greatly from person to person. So there really isn’t a ton of useful commentary I can make on it other than it seems to be very well made, has great ventilation, and is much quieter than my old lid. Your results may vary as it may not fit your head worth a crap. Was there something specific you were wondering? Nope, just curious and really have no need to hunt down a review.